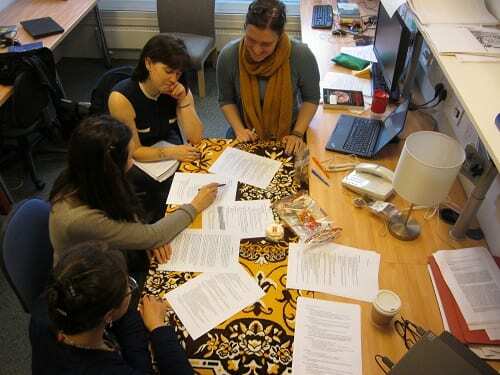 This blog post is meant to offer a glimpse into how our research team is negotiating a question that has become central to our collective work so far: How can our collaborative, ethnographically-situated anthropological research project develop a shared theoretical framework? This question emerged last term, following the launch of our Emerging Subjects project in September 2014. We spent the first three months of our project at UCL reading books and articles we collectively curated to address theoretical themes relating to our new project. Our varied academic backgrounds and theoretical interests inflected and enriched our discussions on readings, ranging from extractive economies and resource making to economic performativity and the anthropology of time. In the beginning, we found ourselves working through various literatures by drawing heavily on our past research in Mongolia. Because we each brought to the project years of experience in the country, there was a lot of sharing of ethnographic examples and anecdotes. These conversations were very useful in that they not only helped us as a new team become more acquainted with each other, but they also helped us flag key topics we saw as potentially significant for our project to explore. We also used these ethnographic insights in short individual writing tasks. Writing in quite creative ways, we explored how much traction themes such as subjectivity, temporality, and neoliberalism might have for our thinking about the shifting economy in Mongolia. As a means to record our lively discussions and the ideas that emerged in our writings, we drafted a somewhat sprawling document aptly named ‘Running List of Shared Themes’. The idea was to create a collective repository of the theories, ideas, and examples that we shared at UCL before we leave for Mongolia this summer to begin our individual ethnographic studies. We also saw it as a document we could reflect back on during our project’s data analysis and writing stages. Yet, we found that a repository documenting themes shared in our group is quite different from developing a shared framework that would allow us as a team to refine and build theoretical insights. This became clear during our readings and writings on neoliberalism. As a group, we debated how we would define and theoretically engage with neoliberalism, a term that could mean anything from a class-based ideological project, to a form of governmentality, to a particular stage of capitalism or modernity. Indeed, our individual writing tasks on neoliberalism reflected what James Ferguson calls the “partly overlapping and partly contradictory” aspects of the term. For example, Rebekah Plueckahn and Baasanjav Terbish focused on the implementation of neoliberal economic instruments in Mongolia and how this resulted in the reconfiguration of state and market practices. Hedwig Waters and I explored neoliberalism less as a ‘project’ and more as a subjective encounter with the world. Rebecca Empson tacked between different approaches, playing with how neoliberalism as an analytical frame can reveal or conceal notions of ‘development’ in contemporary Mongolia. This exercise left us wondering, what now? If our future ethnographies are going to be like these writing pieces, what theoretical insights would we be able to draw? The team deliberating on a theoretical toolkit. Thus, the theoretical toolkit was born. This winter term we compiled one- to two-page ‘toolkits’ for the seven overarching themes that our group collectively decided as important. Each toolkit reviews readings we did on that theme. We highlight what a particular theory – like a tool – offers in terms of analytical usefulness. We then relate these theories to topics flagged as empirically significant for our ethnographic research in Mongolia. When our group reconvenes next term, our goal is to create general statements about what we think each toolkit says. The purpose of this is to generate hypotheses that we can test and compare when our team is in Mongolia conducting individual ethnographic studies. When we return to UCL during breaks in field research, we will reflect on what appears to be similar or different between our studies, and use the toolkits as a way to help us explain these variances. Moreover, these discussions will likely help us redo or refute the general statements associated with each toolkit, so that what we end up with in a couple of years will likely be quite different from what we have now. It is our hope that the toolkits will do more than serve as a shared theoretical framework for our group. We anticipate that recursive engagement with the toolkits will provide a foundation for our group to build theory collectively. Thus, we envision the toolkits to be as much a theoretical outcome of our project as a research methodology.